Europe owns a sizable chunk of the world’s natural resources. Over the past few decades, however, EU countries have mostly imported their resources. But it was simply easier, cheaper, and most importantly it avoided most environmental conflicts. Getting through government regulation and facing off eco-friendly groups is a time-consuming and outrageously expensive business… a fool’s errand. When you can simply import and let other countries deal with all the hassle, it made a lot of sense. But things change. When no one’s got a job, it truly focuses the political agenda. Europe’s job market is a mess. Demonstrators are crying out for action, for opportunity, for jobs. And mines employ a lot of people. The trend is reversing because of Europe’s sluggish economy and the real benefits of the increase in local jobs and the leap in tax revenue that mining projects bring. Of course, local economies benefit. Hotels are full of transient engineers and specialists, grocery stores feed the workers, and bars serve liquor to quench their dusty throats. Seeing the benefits of the jobs, income-tax revenues, and all-around political advantages, a “Raw Materials Strategy” was initiated in 2008, then revised and updated in 2010, and again in 2011. The aim was to encourage sustainable supplies of raw materials from within the EU. It calls for policies in support of domestic mining. So on the one hand, the government says, “Sure, go ahead,” and spends years (and no doubt millions of euros) coming up with a plan, while the other hand slaps down a bunch of rules that stifles initiative, adds massively to production costs, and once more makes mining companies think twice before they put down the millions it takes to get started. Yet the gold mining sector in Europe represents 16,000 direct and indirect jobs as of 2009, and that is surely growing. So for the gold, the tax, the jobs, and for more than a few political careers, mining is right up at the top of the political agenda. And despite the regulation stranglehold governments put on mining companies, they are still reopening abandoned mines and are exploring entirely new areas. For investors, that’s very positive, exciting news. In Casey Research’s BIG GOLD, we’ve been talking a lot lately about the three main zones of metallogenic significance for gold in Europe: the Iberian Pyrite Belt; the Carpathian Arc; and the Baltic Shield. The first crosses from Portugal through southern Spain. The second stretches from the Czech Republic through Hungary, Slovakia, Bulgaria, Ukraine, Romania, Serbia, and into Turkey. Number three, the Baltic Shield, traverses from western Russia through Finland, Sweden, and Norway. Europe’s gold mining contribution is approximately 1.2% of global mine production (though demand from the EU is roughly 15% of worldwide totals). Sweden, Finland, Spain, and Bulgaria are currently the largest gold producers in Europe. They mine about 640,000 million ounces of gold annually. Other countries with operating gold mines are Greenland, France, Greece, Romania, Portugal, Slovakia, and the UK. Among the gold companies operating in the region are Eldorado Gold (EGO) in Greece and Romania; Agnico-Eagle (AEM) in Finland; and Gabriel Resources (T.GBU) in Romania, as well as other majors and juniors across the continent. 2011 was a banner year for European mining. Exploration expenditures were estimated to reach approximately €400 million (US$490 million), an all-time high. The largest share of those exploration dollars was concentrated in Sweden, Finland, Norway, and Greenland. These countries, together with Poland, accounted for €288 million or two-thirds of total exploration expenditures last year. This is even more impressive when put into historical perspective. 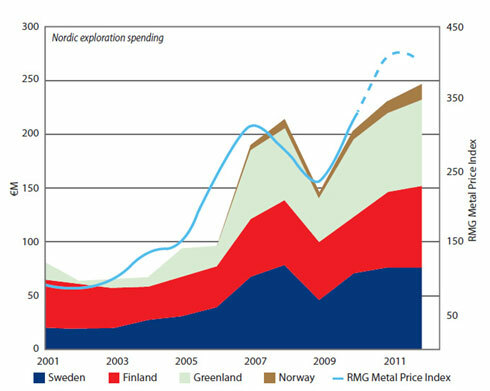 As you can see in the chart below, Nordic exploration spending has grown by almost four times in just ten years. Both local and international companies are active in this region. Further, junior companies that we look at in detail in BIG GOLD are expanding rapidly; Euromines reports that in Sweden, for example, juniors account for some 50% of total exploration dollars being spent. Why has the attractiveness of the Nordic countries increased so dramatically? The area is largely underexplored, and its geological similarity to Canada, Australia, and West Africa makes the Baltic Shield a highly prospective place for new discoveries. Miners know what to expect and they already have the technology in place, so profitability for them and their investors comes that much sooner. These countries have well-developed infrastructure (roads and railways) and telecommunication. They have access to highly educated, trained, and experienced staff to support projects during all phases of mining is widely available. The attitude of both the public and politicians toward exploration and mining is generally positive, especially in the northern parts of the region, though anti-mine protests still take place. Since the area is not densely populated, the NIMBY (“not in my back yard”) factor is largely absent. Keeping the green lobby happy means keeping the mines open, operating, and creating a robust, investment-worthy business. Europeans tend to be very concerned about ecology, so environmental issues are closely watched and strictly regulated. Though most responsible miners make concerted efforts to reduce their impact on the environment, miners in Europe focus on this to a high degree. The divide between miners and environmentalists has shrunk over the past few decades due to advances in technology. But a bigger reason for the cooperation is the eroding economic situation. To a certain degree, politicians have been forced to find a more reasonable balance between conservation and the economic benefits mining can bring. Spain, for example, has its economic back to the wall, starting with a record unemployment rate of more than 24%. Astur Gold (V.AST) is working on getting the Spanish Salave gold deposit into production (which a previous company failed to do in 2005). The jobs it will bring no doubt add to the appeal; the company has received over 6,300 job applications. Management has received two of three environmental permits and hopes to finalize the third by year end. If the project is fully permitted, the economic impact on the area will be both immediate and dramatic. Will the Driller Killer Return? The biggest threats to mining in Europe are resource nationalism, significant skills shortages, and infrastructure access in certain areas (see first news item below). However, even on these issues, Europe is in a better position than many other areas. The continent has a strong tradition of transparent and stable laws, along with respect for private property, leaving few in support of outright nationalization. Western European countries also usually have well-developed infrastructure and an educated and skilled labor force. On the other hand, bureaucratic procedures, overregulation, and a dense population outside of the northern countries have worked to keep massive mine development across Europe from accelerating as it has elsewhere. If Romania approves Gabriel Resources’ Rosia Montana gold mine, for example, the project is estimated to bring some US$30 billion of economic benefits to the country. The company hopes to mine 9.6 million ounces of gold and 51.5 million ounces of silver over 16 years. Eldorado’s Olympias and Skouries mines in the Halkidiki region will produce about 350,000 ounces of gold annually beginning in 2015. Management is spending €1.3 billion to develop the projects, which will create 1,800 jobs in a country where unemployment is close to 20%. Overall, the atmosphere for gold mining in Europe appears to be improving. Its importance is recognized in Brussels; even though only a few clumsy steps have been taken, the general attitude is making a positive shift. With the benefits mining can bring – more jobs and greater revenue – we think there will be fewer objections overall, especially in the more desperate countries. It won’t solve all their problems, but there’s no doubt it would relieve some of the fiscal pressure. From an investment point of view, it’s a region to watch. We fully expect to find increasing opportunities here. Jeff Clark is the senior editor of BIG GOLD, a monthly newsletter that follows the world’s best precious metals production and near-production companies. Jeff has recently completed a rather interesting special report – The Four Stocks I’m Buying My Mother – with details on precious metals stocks that are so undervalued he has recently begun buying them for his mother’s retirement account. Readers can receive the special report for no charge with a 90-day, risk-free trial subscription to BIG GOLD. Next: Next post: Perhaps you have noticed the Maze Trap?